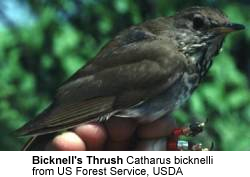 The Bicknell's Thrush, Catharus bicknelli, is found in the coniferous forests in southeastern Quebec to Nova Scotia and northern New England and New York state; where it typically occurs at higher elevations. They migrate to the West Indies. Their numbers are declining in some parts of their range due to habitat destruction. This is a medium-sized thrush with an olive-brown plumage above, slightly reddish on its tail. They have grey cheeks and faint grey eye-rings. The legs are pink. Below it is white with grey on the flanks. The chest is greyish brown with darker spots. Similar Species: They look similar to the Gray-cheeked Thrush - except being slightly smaller. Its bulky cup nest is usually built close to the trunk of a conifer. They usually forage on the forest floor, mainly eating insects, fruits and berries. They make a jumbled series of flute-like tones ending on a higher note.